The other day I was so happy to read the following article and I am sharing it here. 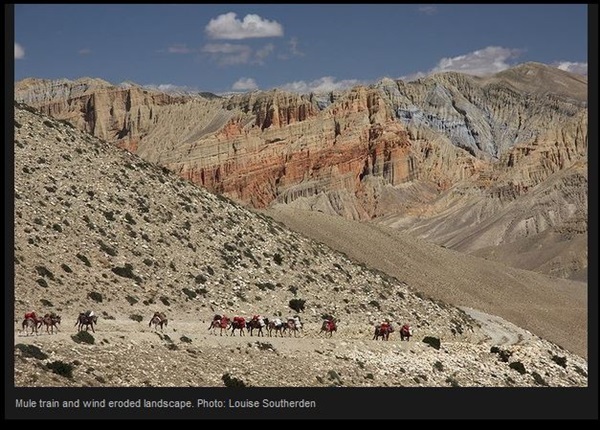 Yes, Mustang, the picturesque town in Nepal has mangaed to get on the list of best places to travel in 2013 list. I have never been there and I hope to go there in the near future. Here are some information regarding the place. Only a few years ago it was “nobody’s been there”, now it’s heading towards “last chance to see”. The completion of a road connecting Mustang to China in the north and the rest of Nepal to the south will make all the difference. Lo Manthang, or Mustang as it’s usually called, has been dubbed “little Tibet” or “the last forbidden kingdom”; though politically a part of Nepal, in language, culture, climate and geography, it’s closer to Tibet. The remote region is north of the Himalayan watershed and on the Tibetan plateau, and just south of the border with “big Tibet”, the Chinese one. 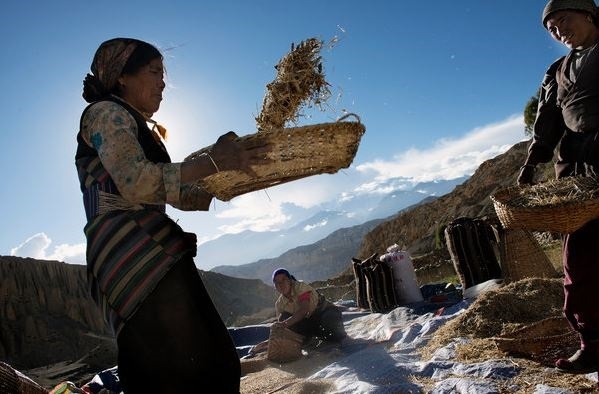 Life in Mustang revolves around tourism, animal husbandry and trade. Apart from nine kilometers between Chhusang and Syangboche (just south of Ghiling (Geling)), it is bisected, as of August 2010, by a new road linking it to the Tibet Autonomous Region (TAR) to the north and to the rest of Nepal to the south. Plans call for these final nine kilometers to be linked within the next few years, at which time the road would become the lowest drivable corridor through the Himalayas linking the Tibetan Plateau to the tropical Indian plains. 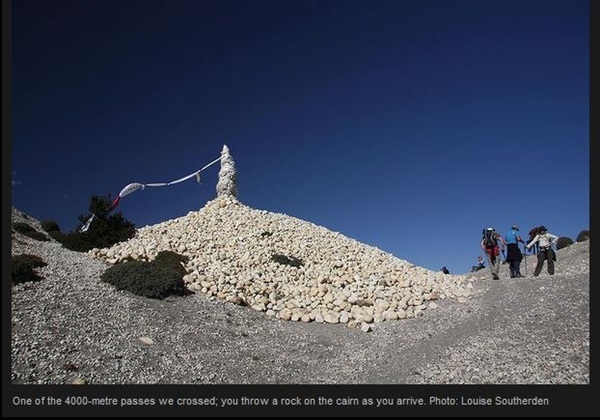 The highest point would be 4660 m at Kora La on the Mustang-TAR border. Currently, the easiest and only widely used road corridor, from Kathmandu to Lhasa via the Arniko Rajmarg (Arniko Highway), traverses a 5125 m pass. The below is an excerpt from the October edition of National Geographic magazine. Some sit by themselves, a single open mouth on a vast corrugated face of weathered rock. Others are in groups, a grand chorus of holes, occasionally stacked eight or nine stories high, an entire vertical neighborhood. Some were dug into cliffsides, others tunneled from above. Many are thousands of years old. 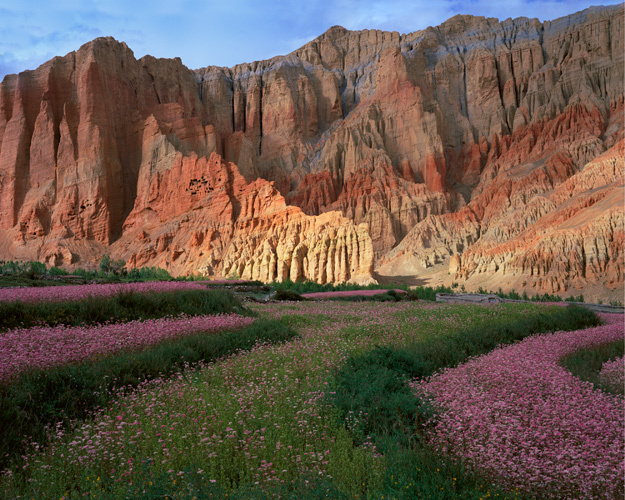 The total number of caves in Mustang, conservatively estimated, is 10,000. Mustang has an average elevation of 13,000ft and is located to the north of the mountain giants of Dhaulagiri and Annapurna and is therefore north of the main Himalayan range and geographically is part of the highlands of Tibet. It is a vast high valley, arid and dry, characterized by eroded canyons, colorful stratified rock formations and has a barren, desert like appearance. 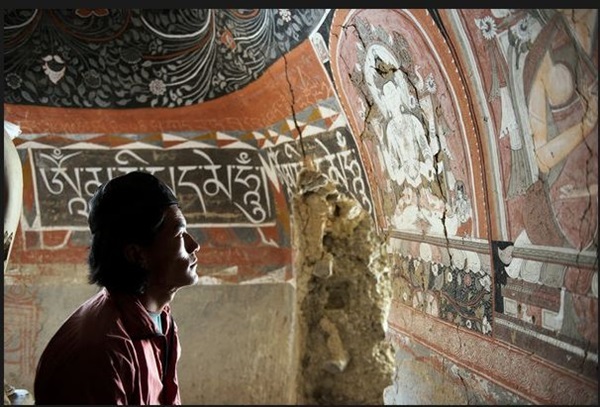 Naturally, most of the history is now a matter of legend rather than recorded fact, but it seems clear that Lo was once part of Ngari, part of Tibet and a rather loose collection of feudal domains. It was incorporated into the Tibetan Empire under the most famous of the Tibetan kings Songtsengampo. 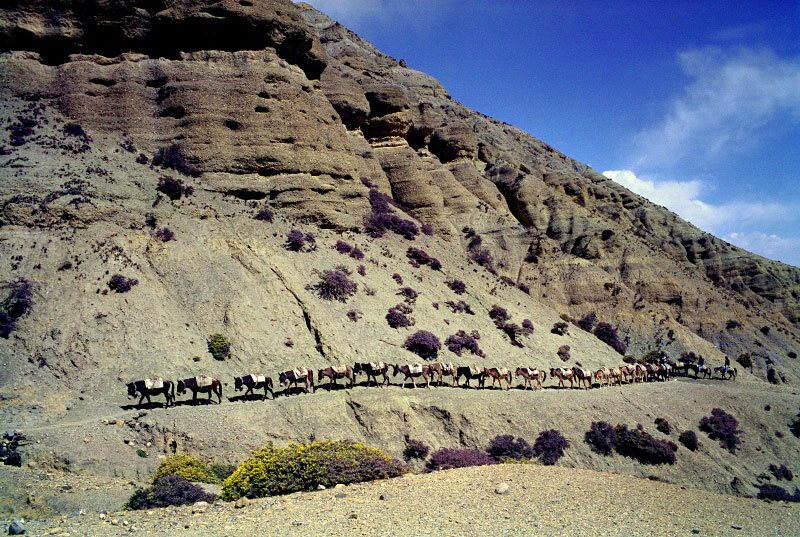 It was an important means of crossing the Himalaya from Tibet to Nepal, and many of the old salt caravans passed through Mustang. By 14C much of Ngari became part of the Malla Empire, whose capital was Sinja in western Nepal. It became an independent kingdom in its own right, under the rule of Ame Pal, the founder king of Lo in 1380. The present royal family can trace its history 25 generations back to Ame Pal, and the city of Lomanthang, was the centre of their power. 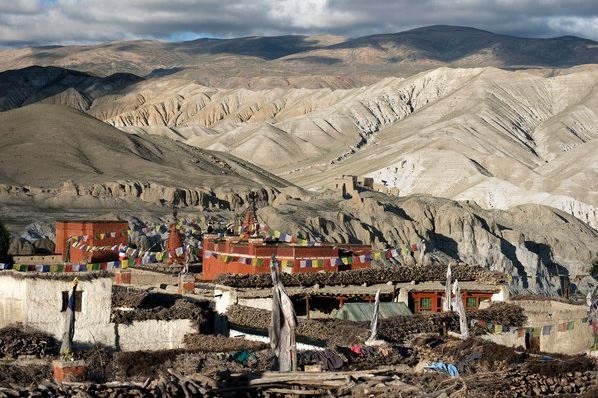 Well known, intrepid explorers such as Professor David Snellgrove and the Italian scholar Guiseppi Tucci visited Mustang in the 1950’s and it has largely been their tales of a Tibetan like arrid region that has fuelled interest in the area. If you love nature or trekking, I am sure you will love it there so do make a plan to go and visit this beautiful place. 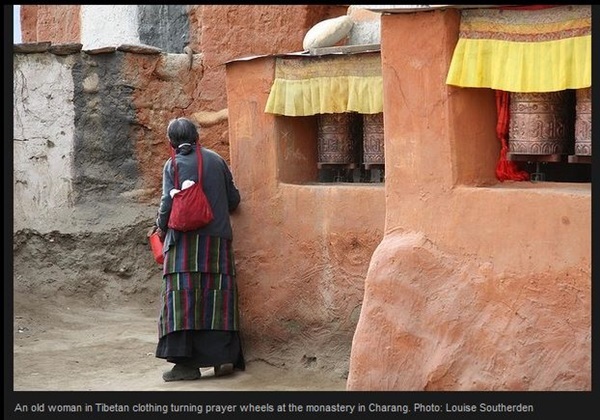 Enjoy some amazing photos from Mustang. 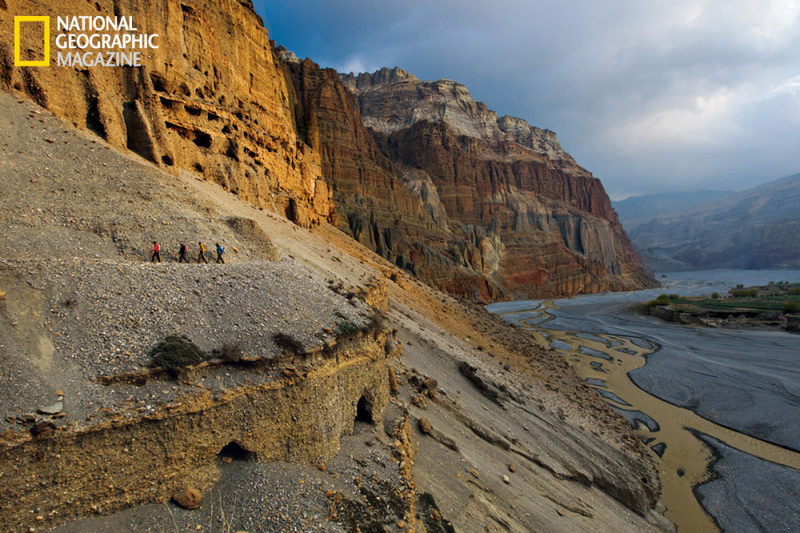 Climbers and scientists follow a trail above the Kali Gandaki River in Nepal’s remote Mustang region. 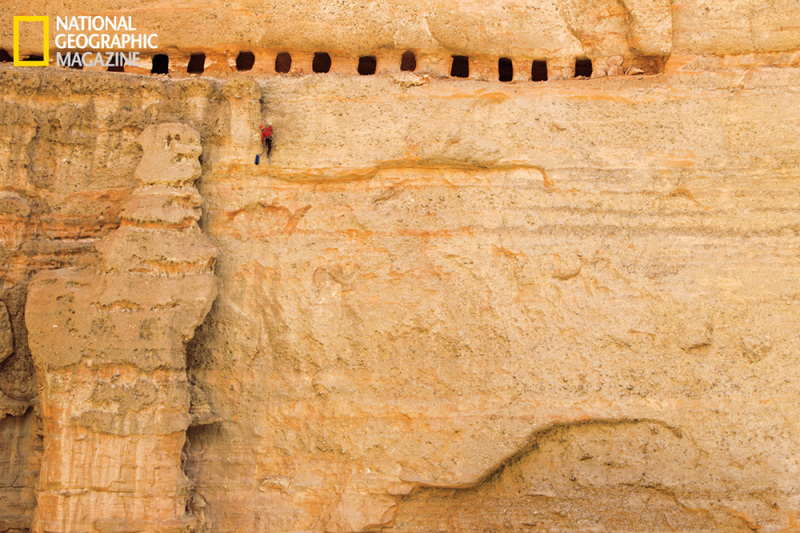 More than 60 feet above are rows of unexplored man-made caves dug centuries ago. There may be thousands in the region. To reach a series of caves dug into a cliff 155 feet above the valley floor, Matt Segal scales a rock face so fragile it often breaks off to the touch. Linked by a ledge, the 800-year-old caves, empty now, may once have stored manuscripts. 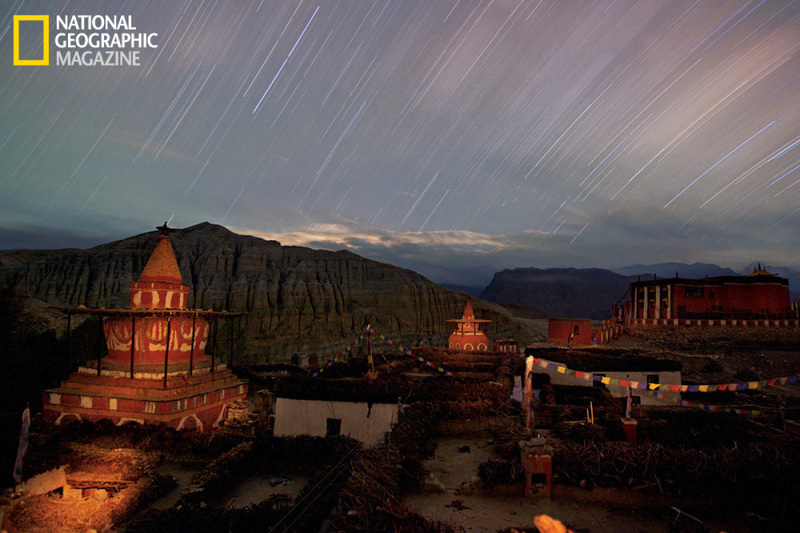 Dusk falls over the temples and homes of Tsarang, once the region’s most important town. 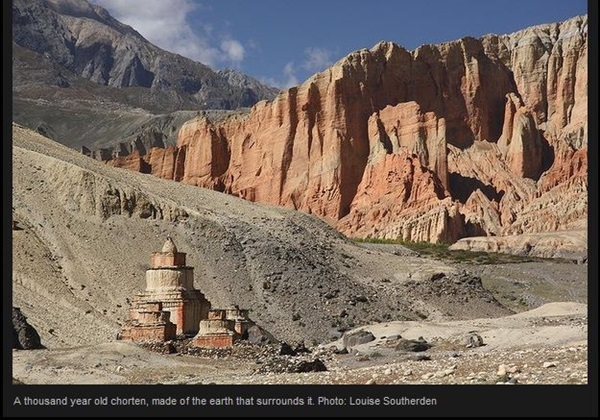 In Mustang, where the centuries have not disrupted the traditional rhythm of life, the caves offer clues to a time when the remote Himalayan kingdom was a hub linking Tibet to the rest of the world. 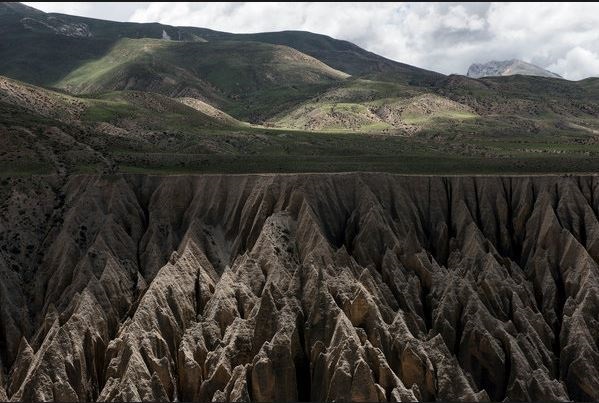 All the images below Credit: Gilles Sabrie for The New York Times The Kali Gandaki riverbed in Kagbeni, Nepal. 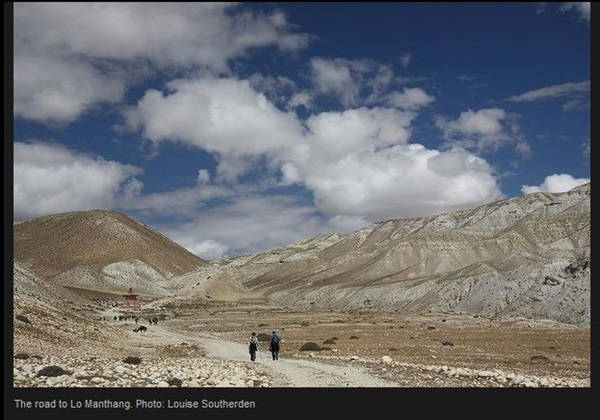 Most trekkers enter Nepal’s Upper Mustang region at Kagbeni. North of Kagbeni, trekkers make their way along a high trail near Samar. 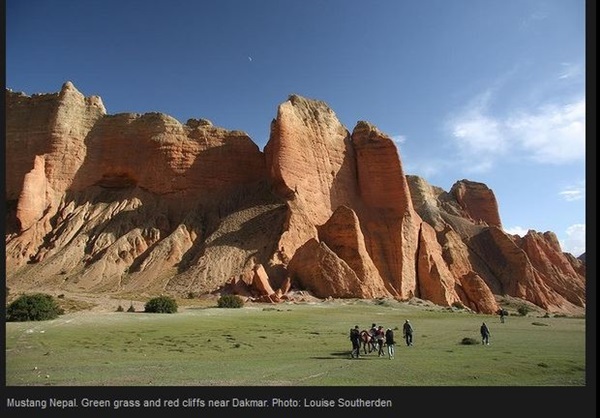 Last year, nearly 3,000 tourists entered Upper Mustang, according to government statistics. Farmers harvesting in the village. 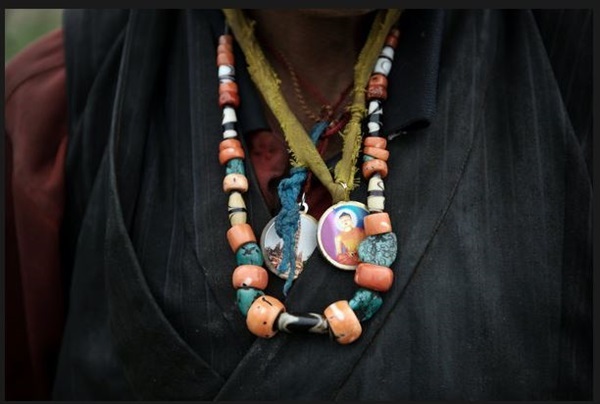 A nomad’s necklaces. 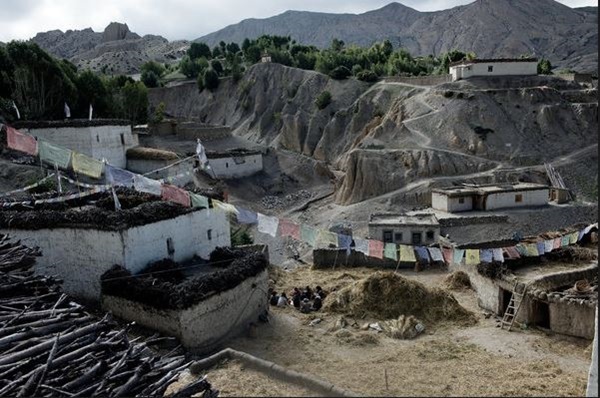 Much of Upper Mustang is desolate, inhabited by about 5,400 people. A view of Lo Manthang, the walled capital of Mustang. A closer view of the capital. 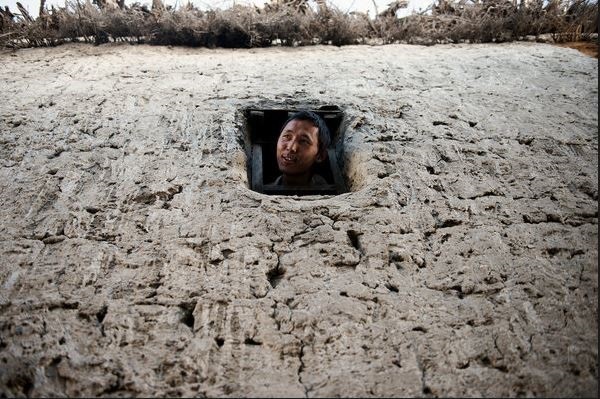 A man appears at his window in Lo Manthang. 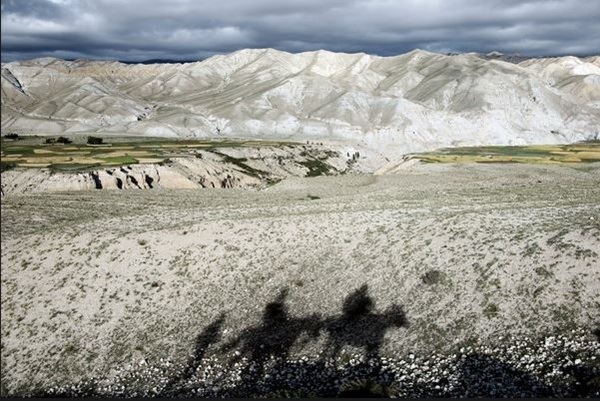 Shadows of people on horseback appear in the barren landscape around Mustang’s capital. Just to the southeast lies Yara. 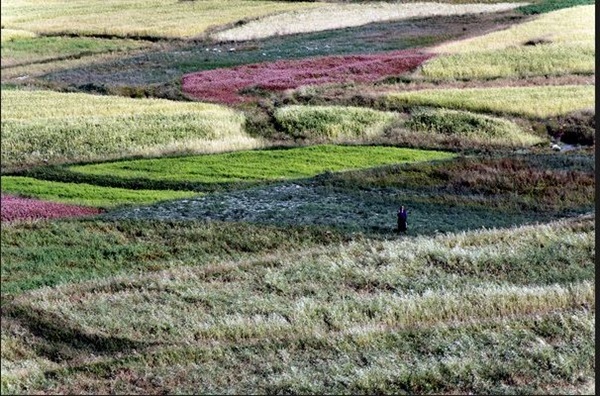 A farmer stands in fields near Lo Manthang. 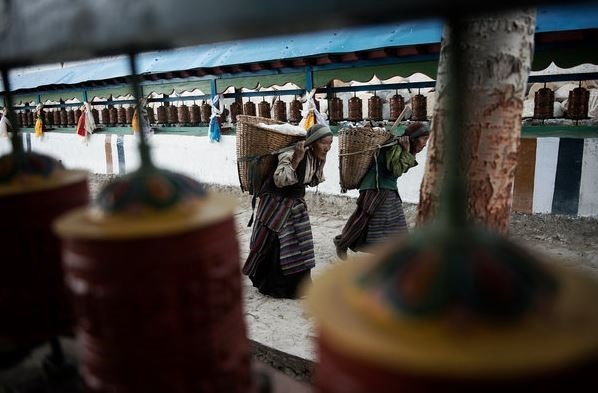 Locals haul baskets between rows of prayer wheels. Another view of Yara. Tashi Kabum, a cave temple near Yara, opened to the public only a few years ago. 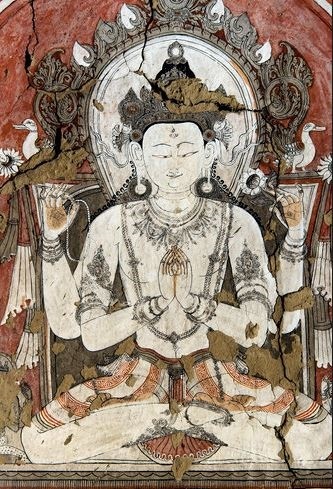 Inside the cave, a fresco representing Chenrezig. 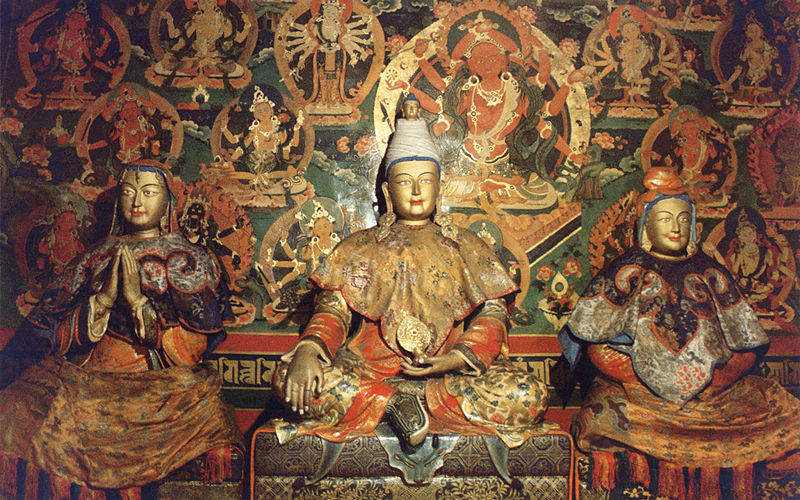 For Tibetan Buddhists, Chenrezig was a bodhisattva embodying compassion. 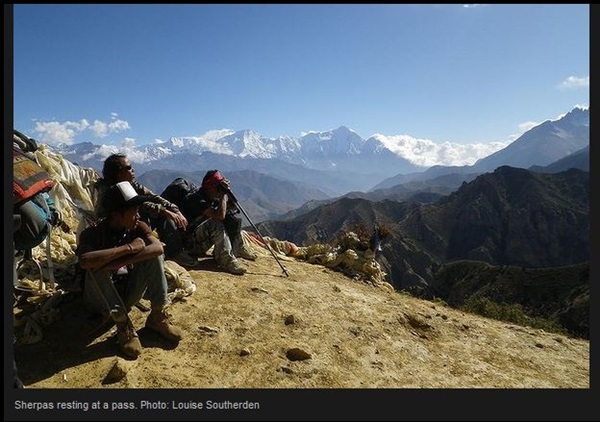 This entry was posted in Nepal, Travel and tagged little tibet, tibet autonomous region, tibetan plateau. Bookmark the permalink. 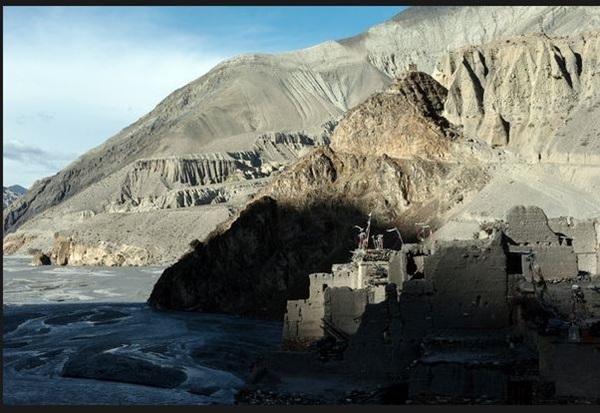 Hey M, Actually I wanted to write a news on Upper Mustang and I am not being able to find a link in which lonely planet has ranked Upper Mustang the Third Best Destination to Travel. Can you please help? Absolutely lobe your blog. I will be visiting Nepal end of this month. I was wondering if you would know if there any means of transportation to get to Mustang?maybe a bus or a taxi?? Thanks you so much for visiting my blog. Good luck with your travel. 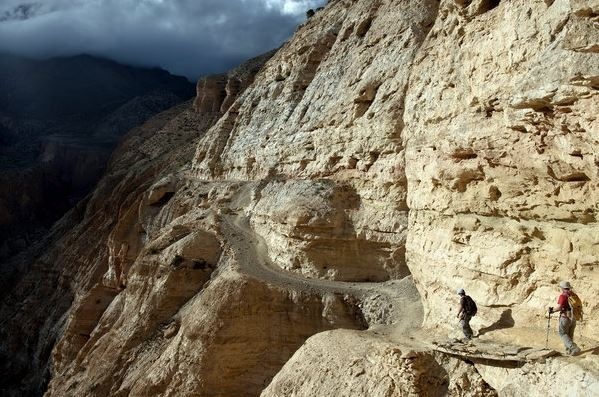 As far as I know , now travel agencies can book four wheels drive to take you to Mustang. It is one of the places I really want to go so will look forward to read your experience and plan mine 🙂 Take care. Hi there ! I saw you read my other blog (www.disturbingthoughts.me). If you like adventure travel, you’ll probably like the pics and advice for routes on my other site: http://www.jeanlouisvanbelle.com. Just check it out. As for Mustang, I know the Bista family quite well – i.e. the dynasty that used to rule Mustang (and still rules it informally – as they dominate business, tourism and politics there). I have a vague plan of organizing a Nepali MTB championship race there – and they’re generally supportive. I’ll keep you updated if you want. If you truly love Nepal, I am also sponsoring some very young and very poor but very talented Nepali racers so they can more racing experience, a bit of exposure abroad (I’ll take a team of four to the MTB Himachal Race in the Indian Himalayas end of September this year). This is fascinating and the photos you collected look so exciting. As soon as I saw the first landscape photo, I noticed that it looks uncannily like the grand canyons and the other canyons in the south west USA – the rocks are the same formation and the same colours (cream with orangey streaks). The photo titled “just to the south east lies Yara” shows dark grey rocky formations that are also like the landscape you see in much of Monument Valley in the Navajo Nation. Reading that it has a gorge that runs far bigger than the Grand Canyon is amazing! I know I am going on and on about this, but the similarities (based on seeing these photos) are remarkable. They have cave dwellings in the Navajo Nation too, in Canyon de Chelly, way up on cliffsides like these ones. They used to have footpaths that made them easily accessible, and were inhabited like a town, but the rockface fell away so now they are very difficult to reach. Anyway, I hope you get to see Mustang next time you are in Nepal and I look forward to reading about your experiences there! Lucky him. $400 just to go there or includes other stuffs? Beautiful I have added Nepal to my must see places. Thanks for sharing . Thanks Paula. Amazing place for sure. I often think, when I see this pictures, about the silence of the mountains. They should probably be so inspiring! Wonderful photos – beautiful. My gosh, you SO make me want to travel, you really do. You going to Nepal in December? It’s one of the options, yes. Wow ! 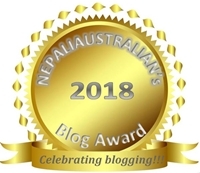 my nepal my pride..incredible, intoxication and unbelievable..this place is on my wish list to trek …last time when i trek i reach Ghasa only…thanks for sharing…. This is on my to do list as well. I hope I can get there one day.